This article of mine, to commemorate the 50th anniversary of the death of the great crime writer Cyril Hare (the pseudonym of Judge Alfred Gordon Clark), appears in The Spectator. If there are any other fans of Cyril Hare out there, I'd be delighted to hear from you. "The best detective story that has appeared for some time and at the end of the year will undoubtedly stand as one of the class leaders in the English school" was how The Spectator described Cyril Hare’s Tragedy at Law, when it first appeared in 1942. ‘A detective masterpiece’ was the New Statesman’s verdict. Others were even more generous in their praise: the crime writer and critic, Julian Symons, included the book in his survey of ‘best, anywhere, ever’. Tragedy at Law is a detective story like no other. There can’t be any other murder mystery in which the killer strikes so late — on the 221st page out of 252. In fact, to label Tragedy at Law a ‘detective story’ does it an injustice. It’s a wonderfully well-crafted and brilliantly characterised novel which just happens to have a crime in it. Agatha Christie presents great puzzles, but if you don’t like puzzle-solving, her books have relatively little to offer. Hare’s work, by contrast, while featuring ingenious mysteries, can be read even by those who don’t particularly care for the genre: even if Judge Barber didn’t get stabbed to death outside the Old Bailey in chapter 21, Tragedy at Law would still be a cracking read. The book is set in that strange, twilight world of the autumn of 1939 — a world of blackouts but no bombs — and portrays in great detail wartime life on the Southern Circuit, with its curtailed pomp and ceremony, but far from curtailed rivalries and jealousies. It was a world that Hare — or rather Alfred Gordon Clark — knew well. Clark was born into a family with strong legal traditions and after schooldays at Rugby (where he said he was ‘starved of food and crammed with learning’) and three years at Oxford (where he obtained a first in History), he made a beeline for the Bar. He learned that his first novel, Tenant for Death had been accepted while on his feet defending a larcenist at Maidstone Assizes. Living in Cyril Mansions in Battersea, and working from Hare Court, Inner Temple, gave Clark the idea for his pseudonym. Hare, the crime writer, certainly put his day job to good use. During the war he worked as a Judge’s Marshal —- providing the inspiration for Tragedy at Law. A short spell at the Ministry of Economic Warfare spawned the wonderfully atmospheric With a Bare Bodkin. Returning to the Bar after the war, Hare reached the pinnacle of his legal career in 1950 when he became a County Court judge. While points of law play a large part in Hare’s books, you don’t have to be an LLB to derive great enjoyment from them. Hare is no show-off, boasting of his superior legal knowledge; his style is easy and fluent, and his books are eminently readable. Four of Hare’s nine novels feature the far from successful, but extremely likeable, defence barrister, Francis Pettigrew. When we first encounter Pettigrew in Tragedy at Law he is leaning back in counsel’s seats in the Shire Hall at Markhampton and reflecting on how little he has achieved. Looking back at the confident — and he could fairly say it now — brilliant young man who had opened his career at the Bar beneath that self-same flaking plaster ceiling, he fell to wondering what had gone wrong with him. Everything had promised well at first, and everything had turned out ill.... Some time he was going to be successful and make money. Some time he would take silk, become a Bencher of his Inn. Some time he would marry and have a family. And now in a sudden rush of disillusionment, from which he strove to exclude self-pity, he saw quite clearly that ‘some time’ had become ‘never’. The transformation of Pettigrew from down-on-his luck Circuit barrister, staying in budget hotels and wearing shabby overcoats, into a fulfilled and happily married man, is one of the delights of the Hare canon. Hare wasn’t only a great novelist; he was a master of the short story. Some of his short stories are very short indeed: in ‘The Rivals’ he manages to construct an intriguing whodunit in a little over 1,000 words. straight from the pages of the Strand magazine and Paget’s illustrations of the Sherlock Holmes stories. The thin, inquisitive nose, the intellectual forehead, the piercing eye, the Oxford common room voice. Although the description implies a certain austerity, there was nothing chilly about Hare or his writing. He was a kindly and compassionate observer of human failings his work is full of humorous insights and devoid of the snobbery which mars much of the detective fiction of the ‘golden age’. Sadly, Hare was cut off in his prime, dying suddenly at the age of 57, exactly 50 years ago this week. While his books have regularly been republished, most recently by House of Stratus at the turn of the decade, the great mystery is that, save for a 1975 Soviet film version of An English Murder, there have been no television or film adaptations of his work. Dramatisation of his novels would, I’m sure, make for wonderful Sunday night viewing. Half a century on from Hare’s untimely death, what better way could there be to bring the work of one of Britain’s finest writers to the attention of a wider audience? "If there were any doubt that the rules of the international game have changed for good, the events of the past few days should have dispelled it. On Monday, President Bush demanded that Russia's leaders reject their parliament's appeal to recognise the independence of South Ossetia and Abkhazia. Within 24 hours, Bush had his response: President Medvedev announced Russia's recognition of the two contested Georgian enclaves. The Russian message was unmistakable: the outcome of the war triggered by Georgia's attack on South Ossetia on August 7 is non-negotiable - and nothing the titans of the US empire do or say is going to reverse it. That this month's events in the Caucasus signal an international turning point is no longer in question. What is clear is that America's unipolar moment has passed - and the new world order heralded by Bush's father in the dying days of the Soviet Union in 1991 is no more. The days when one power was able to bestride the globe like a colossus, enforcing its will in every continent, challenged only by popular movements for national independence and isolated "rogue states", are now over." You can read the whole of Seumas Milne's brilliant Guardian article on the significance of recent events in the Caucasus here. And then, folks, it's time to pop the champagne corks. "They cannot behave in a way that they invade a neighbouring country – completely against international law … and get away with it". says the wannabee British Prime Minister, a propos of Russian action against Georgia. Does his statement mean that he now opposes the illegal invasion of Iraq? There's a wonderfully frank interview with Manchester United's brilliant Serbian defender Nemanja Vidic in today's DT. "I will never stay to live in England, that's for sure. You get only a brief glimpse of sunlight before it's all cloudy again. The winters are mild, but in summer the temperatures seldom go higher than 20C. And it rains, rains, rains. "In Russia and Serbia the people's way of life is similar. In England it's totally different. Here they just don't have time to feel the joy of life." "Throughout the week they all work so hard. They only talk to people at lunch break. Then in the evening they come home and watch the telly, so they can get up early for work the next day. The only time to meet friends is at weekends, but for football players it's the busiest time of all. It was much easier for me to adapt to Russia than England. In England I had no one to talk to. The first month was especially hard. I lived alone in a hotel, which I left only for training. I thought I would go crazy inside those four walls." Well, I'm not a Serb but I agree with much of what Vidic says. Turbo-capitalist Britain is a country where money-making comes before social interraction and feeling the 'joy of life'. Moving to a neoliberal, privatised economy may have given us more material goods, but it's also made us less friendly and sociable. None of this has happened by chance- the big corporations who control our lives don't want sociable, affiliative people taking delight in the simplest of pleasures, but materialistic and perenially dissatisfied consumers. Britain is probably the hardest country in Europe for newcomers, like Nemanja Vidic, to forge deep and lasting friendships and that's because we have by far the most rapacious and profit-obsessed economic system. And the worst thing of all, is that it's this dehumanising turbo-capitalist model that Britain, and America, are trying to impose on the rest of the world. "Recognising an independent Kosovo will push Serbia from the Western orbit as well as creating a real chance of war. And it will set a precedent: if the rights of self-determination for Kosovan Albanians are to be acknowledged, then what about the rights of self-determination for Serbs in Bosnia, who wish to join Serbia? " And of course, what about the rights of self-determination for the citizens of Abkhazia and South Ossetia? Russia's formal recognition today of the independence of those two breakaway republics has been met with an angry response by the neocons and their lackeys. US Secretary of State, Condoleezza Rice, said Russia's move was regrettable. She said Abkhazia and South Ossetia were part of Georgia "and it will remain so". The British foreign secretary, David Miliband, said Russian recognition of Georgia's breakaway regions was "unjustifiable and unacceptable", while German Chancellor Angela Merkel called it "absolutely unacceptable". Sorry, chaps and chapesses. YOU were the ones who played the 'self-determination' card in your drive to break up the former Yugoslavia. YOU were the ones who championed the cause of Kosovan independence. So really, you don't have a leg to stand on when you denounce Russia's recognition of South Ossetia and Abkhazia. "Obama's strongest card is that he represents young America, the future in other words, against John McCain who speaks for the past. So the Republicans are now attacking the notion that he is, in reality, even an American." writes The Exile, in his brilliant post about the anti-Obama smear campaign being waged by neo-con Republicans. A good example of what The Exile describes can be found in today's Daily Telegraph. Uber neo-con columnist and fanatical supporter of the Iraq war, Janet Daley (above), a writer who has attacked Obama repeatedly in the last few months, claims that the Democratic candidate won't lose because he is black, but "for not being American enough". Well, I read the Daily Telegraph almost every day, and for the life of me, I can't remember a more disgusting article that has appeared in its pages than Janet Daley's. Rather than openly playing the 'race card' she is playing the 'Obama is only half American card'. It's cynical and totally disgusting. Let's hope that come the first week in November, John McCain, the '100% American' candidate that Daley and her fellow neocons want so desperately to get into the White House is heavily defeated. How exactly is Obama someone who didn't "grow up American"? He was born and raised in America, but for 4 short years abroad in his early childhood. How does that make one "not American"? John McCain was born in the Panama Canal zone. Many other Americans have spent several years of their childhood abroad, mainly among military families stationed overseas. This is not an unheard of situation. So how can you fool yourself that this is not about race at its core? The "not American" smear is a flimsy cover for some nasty prejudices. Today sees the closing ceremony of the Beijing Olympics and the official 'hand-over' to London, host of the next Games in 2012. To mark the occasion, here's my article from the Daily Express on the first time that the British capital hosted the Olympic Games, exactly 100 years ago. It will, we are told, be the ‘greatest show on earth’. The 29th Olympics in Beijing, will feature 10,500 athletes from over 200 countries competing in 308 sporting events. The Games have cost an estimated £20bn and are supported by an array of household name corporate sponsors. It was somewhat different one hundred years ago, when the Olympic Games were held for the very first time in London. The 1908 Olympics had none of the hype surrounding their modern counterpart and only 22 nations took part. All of the contestants were amateurs, reflecting the Corinthian ideals of the Olympic movement. Most astonishingly, when one considers the spiralling cost for the next Olympiad our capital will host in 2012, running costs budget were a mere £15,000. London was not the original choice to host the 1908 Olympics. The event was to have been held in Naples in Italy, but the eruption of Mount Vesuvius two years previously, which claimed more than 100 victims meant that a new venue urgently had to be found. London only had 20 months to prepare. The fact that it did so, and owes much to one man: the remarkable Lord Desborough. Desborough was a passionate supporter of the Olympic ideal who had won a silver medal in the fencing competition at the “interim” Olympics in Athens Games two years earlier. (The original idea was that the Greeks would host such an interim event every four years between Olympics). A superb sportsman, he also rowed across the English Channel, swam the Niagra rapids twice, climbed the Matterhorn three times and was three times amateur punting champion on the Thames. One day, the superfit aristocrat was infuriated to find his obituary printed in The Times, which had confused him with a similarly-named Lord. "Look here," he cried, "you've published my obituary this morning!" "I'm so sorry, your lordship," the editor replied. "Where did you say you were calling from? Desborough had promised that London would stage the 1908 Olympics at Athens in 1906. But where would the Games be held? To answer that question, Desborough formed an association with the Hungarian entrepreneur Imre Kiralfy who was in charge of the 1908 Franco-British Exhibition. Kallafy built a state-of-the art sports stadium at the site of the exhibition in London‘s Shepherd Bush : the White City. The White City stadium was completed in just 10 months, at a cost of just £60,000. It was an arena whose grandeur reflected the enormous confidence of the British Empire at the height of its power. “The stadium was as broad as the Circus Maximus of ancient Rome”, relates Rebecca Jenkins, author of ‘The First London Olympics’. Its swimming pool was 100m in length, more than double the standard size. The world’s first modern seated stadium, it was constructed to seat 68,000, but could hold over 130,000 with terracing. The glorious new venue was officially opened by King Edward VII on April 27th 1908, a much earlier start than the Games‘ modern equivalent because in 1908 they stretched out over six months. The Olympics had been revived by the Frenchman Baron Pierre de Coubertin in 1896, but prior to 1908 they had not captured the public’s imagination. The future of the modern Olympic movement therefore depended on London putting on a good show. But despite the wonders of the White City stadium, it seemed like the notorious British summer weather would spoil the occasion. Cold and wet conditions meant that spectators were staying away in their thousands. Something needed to be done to revive public interest. The organisers encouraged the King, and several celebrities of the day to attend. But the real breakthrough came when Maud Allen, an exotic dancer in the tradition of Mata Hari, promised to make an appearance. “The first days had drawn disappointing crowds, but when Maud Allan, ‘the Scarlet Princess’, appeared, the 90,000 crowd cheered as if the stadium had been erected specially for her,” says Russell James, author of ‘The Maud Allen Affair’. The rivalry between Britain and the U.S. was intense. “The London Olympics formed a stage for a clash of empires. In the White City stadium the Edwardian English sporting gentlemen met the vigour of the "scientifically trained" Americans,” says Jenkins. In the tug-of-war quarter final, the defeated American team launched an official complaint after the British team, made up of Liverpool policemen, had kept on their service boots. In the mens’ 400m final, there was more acrimony after American John Carpenter ran diagonally across the track to prevent Wyndham Halswelle of Scotland from overtaking him. British judges disqualified Carpenter and ordered the race to be re-run the following day but the American team was so incensed by the decision that the other two American finalists refused to take part, allowing Halswelle to complete the only walkover in Olympic history. The Games saw several memorable performances. American John Taylor, a member of the winning medley relay team, became the first African-American athlete to win an Olympic gold. Tragically Taylor died of typhoid fever shortly after his return home. Joshua Milner from Ireland won a gold medal in a rifle shooting event at the age of 61, making him the oldest Olympic champion ever at the time, while 53-year-old Sybil ‘Queenie’ Newall, from Britain, became the oldest ever female gold medallist when she won the archery contest. But the greatest story of all concerned a little Italian chef and sweet-maker, a Charlie Chaplin look-a-like called Dorando Pietri. Pietri’s running career had started by accident, when as a 17-year-old, he ran an errand for an employer, delivering a letter in person instead of posting it, and covering the 30 miles in about four hours. He had come agonisingly close to winning the marathon in Athens two years earlier when he had to retire due to stomach ache when holding a five-minute lead. In 1908 it seemed that his moment had finally come as a remarkable late burst saw him lead the field into the stadium. But exhausted by his exertions on a hot summer‘s day, Pietri collapsed on the track. Helped to his feet by officials he got up and started running again- only to collapse and recover a further four times. Pietri crossed the line first, 32 seconds ahead of American Johnny Haynes, but was disqualified for receiving help. The British love of a gallant loser however, gave Pietri greater glory than if he had won. On the suggestion of Sir Arthur Conan Doyle, the writer and creator of Sherlock Holmes who had reported on the event, Queen Alexandra presented Pietri with a special gold cup. Pietri became an international celebrity. He was invited to running events all over the world- and the songwriter Irving Berlin even dedicated a song called ‘Dorando’ to him. It was not until October 31st that the 1908 London Olympics finally drew to a close. Most people agreed that the Games had been the most successful yet and they had also established standard rules and measurements which remain to this day. The marathon had been planned for 26 miles, but Princess Mary had the start moved to beneath the windows of the Royal nursery at Windsor Castle so her children could watch, while the finish was adjusted so that it was in front of the Royal Box. This added 385 yards to the race, which remains the same distance today. The 1908 Olympics was also a financial success, with a profit of more than £6,000 recorded. The hosts excelled on the sporting field, too. Britain’s final tally of 56 Gold, 50 silver and 39 bronze medals was almost as many as the other 21 nations combined. In just four years time, London will stage its third Olympics. The 2012 Games are predicted to cost £9bn and the country will have had five years more to prepare for them than Lord Desborough and his fellow organisers had a century ago. But whether they- or the glitzy multi-billion pound, corporate-sponsored Beijing Olympics will prove as successful, or as memorable is another matter. One thing is certain: Britain won't win as many medals. Here's my article on the lost government data fiasco from The First Post. Data including the names, addresses and dates of birth of around 33,000 offenders in England and Wales with six or more recordable convictions in the past 12 months on the Police National Computer have been lost by the private company PA Consulting, contractors for the Home Office. Also lost were the names and dates of birth of 10,000 prolific and other priority offenders, and the names, dates of birth and, in some cases, the expected prison release dates of all 84,000 prisoners held in England and Wales. Back in December it was announced that US firm Pearson Driving Assessments, a contractor to the Driving Standards Agency, had lost the details of three million candidates for the driving theory test. Pearson reported that a hard drive was missing from a “secure facility” in Iowa. Shadow Chancellor Dominic Grieve says, a propos of the latest loss of data by a private company: "What is more scandalous is that it is not the first time that the government has been shown to be completely incapable of protecting the integrity of highly sensitive data, rendering them unfit to be charged with protecting our safety." Of course, Grieve doesn't mention that it's a private company, not the government, which has lost the data. He doesn't because he and his party are fanatical supporters of privatisation- and the process of sub-contracting government tasks to private, often foreign owned companies. In fact, it was the Conservatives who started this process when they were last in power. The biggest charge that can be made against the present government is that they have continued with such a disastrous policy. Back in the 60s and 70s, before the days of privatisation and sub-contracting government work to private companies, such loss of data never occured. Once again, the British people are losing out due to adherence to neo-liberal dogma. PS Any pro-privatisation fanatics out there who would like to argue that sub-contracting the work of government departments to private companies has improved efficiency? "The secrets of the crushing of Yugoslavia are emerging, telling us more about how the modern world is policed. The former chief prosecutor of the International Criminal Tribunal for Yugoslavia in The Hague, Carla Del Ponte, this year published her memoir The Hunt: Me and War Criminals. Largely ignored in Britain, the book reveals unpalatable truths about the west's intervention in Kosovo, which has echoes in the Caucasus. With the Nato bombing over, international teams descended upon Kosovo to exhume the "holocaust". The FBI failed to find a single mass grave and went home. The Spanish forensic team did the same, its leader angrily denouncing "a semantic pirouette by the war propaganda machines". A year later, Del Ponte's tribunal announced the final count of the dead in Kosovo: 2,788. This included combatants on both sides and Serbs and Roma murdered by the KLA. There was no genocide in Kosovo. The "holocaust" was a lie. The Nato attack had been fraudulent." You can read the whole of John Pilger (pictured above)'s brilliant New Statesman article on the criminal and fraudulent US-sponsored aggression against the Federal Republic of Yugoslavia here. Sadly too many progressives swallowed the anti-Yugoslavia lies and propaganda in 1999, which only paved the way for the equally unlawful aggression against Iraq four years later. The Road to Baghdad began in Belgrade, as I've said on several occasions, but it won't end there until progressives wake up to the fact that the grounds for war against Yugoslavia in 1999 were as fraudulent as those used to justify the attack on Iraq in 2003. The Competition Commission has called for BAA, the Spanish company that owns several of Britain's leading airports, including Heathrow and Gatwick, to be broken up. But the answer to Britain's airport woes is not allowing yet more profit-hungry plcs to own and operate our airports, but simply to re-nationalise BAA. Here is my First Post article from last summer on why renationalisation makes sense. We can't blame BAA for treating every square foot at Heathrow as a profit centre: it's a private company which wants to maximise returns for its shareholders. But we can blame the politicians foolish enough to sell off BAA in the first place. Allowing other profit-hungry plcs to compete to run our airports would only mean more of the same. Well, lots of contenders for this week's award but in the end it goes to the man, who if opinion polls are correct, will be the next British Prime Minister. I like Georgia. I like Georgians and their superb hospitality. I have several times travelled to that beautiful country. But I wouldn’t lift a finger to save it from the Russians. What cause would we be serving? Democracy? Ha ha. This Olympically corrupt statelet is not a law-governed democracy. President Mikheil Saakashvili’s nauseatingly named Rose Revolution was a putsch achieved by an orchestrated mob, followed by an election so shamelessly one-sided that our supposed hero got 96 per cent of the vote. The only excuse for this was that previous elections had been rigged, too, which of course they had……..
Do we really want young men from the Midlands of England and the Lowlands of Scotland fighting and dying for years to come to save this dubious creature from his own unhinged, wilful conflict with the Kremlin? You might think not, but David Cameron is all for it. In an amazing demonstration of unfitness for office, the Tory leader last week wrote one of the daftest articles I have ever seen. He wants Georgia to be allowed into Nato, so committing this country to come to Georgia’s defence if it is attacked. He wants to do the same for Ukraine. Will someone send this man an atlas and a history book? When will our political class stop trying to grow hairs on their teenage chests by starting wars and deploying forces we no longer have? Why should we get entangled in this? What business is it of ours if Russia wants friends and allies on its borders, rather than a weird Nato alliance, kept on life-support long after it triumphantly achieved its purpose. What is Nato for now? Does anybody know? If they know, will they say? Britain has no interests in following American adventures in the Caucasus, let alone taking sides over the dangerous future of Ukraine. You can read what Peter calls "one of the daftest articles I have ever seen", here. "When David Cameron claims Margaret Thatcher is his role model, he is not being entirely truthful, his real hero is Tony Blair. For like his mentor, Cameron could have just as easily joined the LP and vice versa. Neither man has a political conviction beyond gaining power and once it is attained never placing themselves even a millimeter out of step with what they regard as the supreme power on this earth, the President of the USA." What's clear from this week's events is that Dave, as I pointed out in my Guardian article of October 2005, is in hock to the neocons. The neocons were terrified that Ken Clarke, a man who had scoffed at the WMD 'Iraqi threat' nonsense, would become Tory leader three years ago, so threw their lot in behind the MP for Witney as the ideal 'Stop Clarke' candidate. Prime Minister Dave would be Tony Blair Mark Two, so if you want a real change from Nu Labour (and who doesn't?) don't be fooled that voting Tory will mean a change in Britain's disastrous foreign policy. Many congratulations to the brilliant sportsmen and women from Team GB who made it such a memorable weekend for Britain at the Olympics. Well, if British politicians were competing in Beijing, we all know what event they- and their US counter-parts would be excelling in. Here's my article on the glaring double standards of the British and US governments, from the Morning Star. There are 28 sports in the Beijing Olympics. Hypocrisy isn’t one of them- but if it was- then the US and Britain would surely be battling it out for the gold medal. For when it comes to double standards, these two past-masters make everyone else look like also-rans. In the last few days, they’ve been in particularly sparkling form. After just one day’s fighting between Georgian and Russian forces, the US and Britain were calling for an "immediate ceasefire". Could this be the same US and Britain, who repeatedly rejected the widespread international calls for an immediate ceasefire during the 2006 Israel-Lebanon conflict? The US and Britain also say that they support Georgia’s "territorial integrity". Could this be the same US and Britain who, by championing Kosovan separatism showed nothing but contempt for the ‘territorial integrity’ of Serbia? In addition, the US has condemned Russia for what it calls its "dangerous and disproportionate" action against Georgia. Yes, that’s right, the country which launched ‘Shock and Awe’ against a largely defenceless and impoverished Middle Eastern nation five years ago-on a wholly fabricated pretext-- accuses others of taking ‘dangerous and disproportionate action’. Chutzpah really isn‘t the word. The US has also accused Russia of seeking "regime change" in Georgia. That’s rather like John McEnroe accusing another tennis player of being impolite to the umpire. When it comes to seeking "regime change" the US are undisputed world champions- they’ve toppled regimes from Belgrade to Baghdad, from Tehran to Tblisi. The US is to regime changing what Casanova is to making love- no one has done it more often. Of course, what underpins the US and British hypocrisy is a colossal arrogance. It’s an arrogance which seeks to extend NATO to the doorstep of Russia. Imagine if Russia was encouraging Mexico or Canada to join a Russian-led military alliance, and 1,000 Russian troops were engaged in exercises in Mexico as US troops were only last month in Georgia? Or if Russia announced it was to site a missile defence system in Jamaica- as the US has done in the Czech Republic and Poland? It’s sad to see so many journalists in America and Britain fail to challenge the attitudes which underpin the blatant hypocrisy of their country’s foreign policies. Do they honestly think that different standards should apply to the US and Britain for everyone else? The US and Britain claim to be keen supporters of democracy, but when the electorate don’t vote the ’right way’ whether it be in elections in Palestine or in Belarus, they call the vote invalid. Ninety-nine percent of people in South Ossetia voted for independence from Georgia, but as far as US and Britain is concerned, the "territorial integrity of Georgia" should be maintained. In Kosovo though, a majority in favour of independence is enough to gain US and British support for secession. At the same time, the wishes of the Serbs in Republic Srpska to join up with Serbia have been ignored. It seems that self-determination, like democracy, is a principle to only be selectively applied as far as these Olympic champions are concerned. British Armed forces Minister Des Browne has called Russian military action in South Ossetia "deplorable". But the most "deplorable" thing of all is the breathtaking double standards of the United State and its most loyal poodle. "Surely it's scientifically impossible to find a more charming film than Miss Pettigrew Lives for a Day", says the First Post review. Well, I certainly can't remember seeing a more charming film. "Everything you could possibly want in such a movie is here: the Cinderella-esque transformation, the simmering cat-fights, the wonderful costumes, the fabulous music... light and airy and sweet, it's a perfect little souffle of a movie." I can only concur- 'Miss Pettigrew Lives for a Day' is the best- and most enjoyable- new film I have seen since Peter Bogdanovich's superb 'The Cat's Meow', a few years back. Like 'The Cat's Meow', Miss Pettigrew is wonderfully old-fashioned, the sort of film that Hollywood used to make- before the 'special effects'/ let's put as much violence into a film as is possible' brigade took over. It's a film for those who don't really like modern films and who are sick and tired of ultra-violent, soul-destroying crap being served up as 'entertainment'. If you haven't seen it yet- head on down to your nearest cinema/movie theatre asap- you're in for a real treat. And if you read it- then ignore this terrible Daily Mail review of 'Miss Pettigrew' from Friday. The person who wrote it clearly hasn't got a heart. It's time to announce a new award. The barrage of hysterical, completely O.T.T. articles/comments re 'the Russian threat', in the light of Russia's perfectly legitimate and proportionate action to stop ethnic cleansing and genocide in South Ossetia, made me think it's time to hold a contest for 'Russophobe of the Week'. The competition is intense and it's been a difficult task to draw up a short-list. Below are some of my favourites (I particularly love 'Stan anti-fascist's) ; if there are others you'd like to include, please post them in the comment box, along with your votes, in a 1-3 order. May the best (or rather the worst) man win! "This is the end. Columns of Russian tanks are heading Tbilisi. Georgians who are still alive retreat to their capital city to defend it and die. The president of the dying country is still heard pleading the world to save his country and people, whose only fault was to trust the West and have chosen democracy as way of life. In response, Mr. Bush repeates (sic) he condemns Russia. The other Western powers, in order to conceal their fear, keep pretending they believe the satanic Russian lies about the true situation that was cooked up for the start of long planned destruction of Georgia. This is the end. Evil and Lie have won. The world is near its end". "For Georgia, read Czechoslovakia. For South Ossetia read Sudentenland. For Russia read Germany. For Vladimir Putin, read Adolf Hitler. For 1938 read 2008". By Bruce Burniston, comment left on Denis Matyjaszek's Daily Telegraph article. "Today we are all Georgians." Marko Attila Hoare, writing on his 'Greater Surbiton' blog (I must say I find Marko's boyish enthusiasm for the neocon cause quite endearing, in a funny sort of way. Marko once told me that he received no payment at all from The Henry Jackson Society, the neocon pressure group of which he is 'European director': I find that quite scandalous considering the amount of work he does propagandising for the cause). "Vladimir Putin has dropped - literally - a bombshell. By ordering a full-scale military invasion of Georgia, he has revealed the true face of his autocratic rule. By flying in person to the scene as if he was field commander-in-chief, he is showing the world that Russia will revert to being a military power willing to bully and threaten its neighbours." Denis Matyjaszek, Daily Telegraph (er....what 'full scale military invasion of Georgia, Denis?). "As so often with bullies, the Russian government's behaviour disguises deep insecurity and a craving for respect. This makes it more susceptible to our opinions than we often think. Further aggressive steps against Georgia would certainly be a reason to reconsider whether Russia should continue to enjoy the prestige that comes with membership of the G8. Another possible response ties in nicely with our current Olympic obsession. Russia is due to host the Winter Olympics in 2014 at Sochi and hopes to use the event, like the Chinese, as an expression of its power on the world stage. There would be very good grounds for asking the International Olympic Committee to consider whether a country that was actively working to dismember a neighbour only a few kilometres from Sochi was an adequate standard-bearer for the Olympic ideal." David Clark, from the (anti) Russia Foundation, writing in The Guardian. (David is no relation, I'm very pleased to say). "You can talk about 1938; you can talk about 1914; you can even, if you want to show off, talk about 1811-12: what is in no doubt is that, several times in the modern era, the course of history has been changed by an escalation from the sort of opportunistic bullying we have seen in Georgia, and only a fool would say it would not be again. Faced with the choice of having to switch off the lights at 8pm in the winter while putting on a thicker sweater, or having a nuclear holocaust, I know how I would prefer the West to make its point against this aggressor". Simon Heffer, Daily Telegraph. (Sorry Simon, but I don't think I'll be joining you in switching the lights out at 8pm). Dirty tricks at the Olympics? 'Who judges the judges?' is one of the oldest questions in jurisprudence. It's a question that has particular relevance in Beijing after some highly controversial decisions in the first week of the Olympics. Chinese shooter Hu Binyuan appeared to miss at least one - and possibly three - of the clay targets in yesterday's double trap event, yet was still awarded full points by local judges, enabling him to win the bronze medal. Australian competitor Russell Mark, who finished fifth, claimed that the boisterous home crowd had influenced the judges' decision. In boxing, British bantamweight Joe Murray was incensed after judges awarded victory to Gu Yu, his Chinese opponent by 17-7. "The judges took it away from him," Murray's coach Terry Edwards protested. "I thought they were very generous to the Chinese lad. You expect a slight bias, but you come to the Olympic Games and expect a level playing field." The British complaint came just hours after a Ukrainian protest against their lightweight Oleksandr Klyuchko's controversial 10-8 defeat by another Chinese fighter, Hu Qing. "I thought the Chinese opponent was not very good," Klyuchko said. At last year's world championships Klyuchko had easily defeated Hu Qing 26-13. The judges in the boxing were not Chinese, but a wildly enthusiastic home crowd may have played its part in swaying their verdicts. Eyebrows have also been raised by the high marks awarded to Chinese contestants in both the synchronised swimming and diving events, even when performances were far from flawless. The complaints have not just concerned biased judging but also alleged gamesmanship by Chinese officials. The US women's gymnastics team coordinator Martha Karolyi accused the Chinese of continually disrupting team captain Alicia Sacramone's preparations, claiming they contributed ther slipping up on the balance beam, and to America's defeat by China in the final. "First they called her [Sacramone's] name up, then they did not even put her name up even though the Chinese had finished... She was mentally prepared and then she had a mental break, then after not doing the job on the beam, her concentration for the floor exercise was bothered." Sour grapes? Perhaps. But there is a tradition of host-country bias at the Olympics. To this day, South Koreans are still mystified as to how their boxer Kim Dong-Kil was adjudged to have lost 4-1 on points to America's Jerry Page at the 1984 Los Angeles Olympics, despite having outclassed his opponent. In the 1980 Moscow Games, television pictures showed Russians opening the giant doors at the end of the stadium behind the javelin throwing area when the Soviet thrower was competing and closing it again when he wasn't; the idea being that the draught funnelled through would give the javelin a bit of extra lift. And 100 years ago, in the first London Games, there were angry American complaints after their runner John Carpenter was disqualified by British judges after winning the men's 400m having been adjudged to have blocked the British runner Wyndham Halswelle. The problem it seems is one of prestige. Host countries desperately want to win as many gold medals as they can. When showcasing a political system is part of the equation - as in Moscow in 1980, Los Angeles in 1984 and Beijing today - the pressure is even greater. Banning judges from officiating athletes from their own country, as recommended by Australian Olympic Committee president John Coates, in the light of the double trap shooting controversy, is clearly a sensible idea. But even when only neutral judges are allowed, as in boxing and judo, arbiters have historically shown bias towards competitors from the host country. The problem is not just one of cheating. It's that everyone wants to please the Olympic hosts just that little bit too much. Well, the last few days have seen a barrage of Russophobic and wildly inaccurate articles in the western media about the situation in South Ossetia and Georgia. With one or two exceptions, our airwaves and television news bulletins have been full of reports all spouting the same misinformation- about how Russia was invading Georgia, how Russia was the aggressor and how 'plucky little Georgia' was under grave threat. But our friend The Exile was having none of it. He called the conflict right by mainly taking with a huge lorry load of salt, all the press releases coming out of the Georgian Ministry of (Mis))Information. The Exile spent all his weekend blogging about South Ossetia, and the quality of his posts were terrific. Unlike many of the 'experts' and 'analysts' who gave the western public such a misleading impression of what was going on in South Ossetia over the last few days, The Exile is not a rich man and he's put up an appeal on his blog for voluntary donations so he can carry on providing such an excellent service to readers. Please try and support him if you can, even a fiver would be hugely appreciated. "I'm sure a lot of Belgians feel it is unfair that the Champions of a country have to play a qualifying round to get into the Champions League". I'm sure a lot of people outside Belgium, and in Britain too, agree with him. Liverpool finished fourth in last season's Premier League. They should be playing in the UEFA Cup, not the Champions League. I'm not anti-Liverpool- I've long admired the club- but I am totally against the current Champions League format which is ridiculously biased towards the teams of Europe's richest leagues. I'm old enough to remember when teams from smaller European countries like Belgium got to European Cup finals. But that won't happen again until we scrap the current Champions League format. Russia has suspended military operations against Georgia. According to a statement, Mr Medvedev told his defence minister and chief of staff that "the goal has been attained". "I've decided to finish the operation to force the Georgian authorities to peace. The safety of our peacekeeping forces and civilian population has been restored. "The aggressor has been punished, having sustained considerable losses. Its armed forces have been disorganised," he added. The aggressor certainly has been punished. But this is a crushing defeat not only for Georgia and their neurotic, hysterical, and unbelievably wallyish President, but for the entire Russophobic movement. The British scribblers who wrote of Russia's invasion of Georgia, like Simon Tea-Bag What a Furore in today's Times, and the equally preposterous Russophobe David Clark, in yesterday's Guardian (thankfully he's no relation), have got an incredible amount of egg on their face. There was no 'Russian invasion of Georgia'- if you wanted the truth on this all you had to do was read The Exile. I think over the past few days our Mexico-based friend has proved to be a far more accurate commentator on events than any so-called Russophobic 'experts' and 'analysts' you'll find in the British media. Russian Ambassador to NATO Dmitriy Rogozin said today in Brussels that Russia does not take lessons from those who were killing Serbs and destroying Serbia's infrastructure in 1999. "NATO’s communiqué about the excessive use of force in the South Ossetia makes Moscow remember the operation of the Alliance against Serbia. Russia will not listen to such assessments from this military bloc, because it would then have to remind of the disproportionate use of force against the people and armed forces of Serbia, when NATO tried to give Serbs 'joys of democracy' through bombardment of Belgrade, destruction of Serbian towns, bridges and infrastructure", Russian Ambassador said at the press conference dedicated to Russia's military operations in South Ossetia. "In 1999, NATO assessed that Slobodan Milosevic's policy is bad towards Kosovo-Metohija Albanians, but it decided not to bomb only the Serb troops in Kosovo, but the entire territory of Serbia, including bridges, hospitals, TV stations and state institutions... Thousands of Serbian civilians were killed in those attacks", Rogozin said. Above you can see a picture of NATO's use of 'excessive force' in Yugoslavia in 1999: the shameful bombing of a passenger train at Grdelica Gorge which killed 14 civilians. Remember it, and all the other innocent victims of NATO's aggression, next time you hear a spokesperson from that organisation criticise others for using 'excessive force'. In the anti-Russian hysteria of the moment, it's important to get the facts right. I might also add a personal note: during my time living in Hungary in the 1990s, I rented a flat from a Jewish landlord, an erudite and kindly man who became my good friend. Every year on the anniversary of the Soviet liberation of Hungary he would go to the Russian cemetery and lay a wreath. Had the Russians not arrived when they did- he and his family simply wouldn't be alive. I'd like to see someone explain to him that the Soviet Army in 1945 was not an army of liberation. Neo-con aggression thwarted in the Caucasus. Sheffield Wednesday top of the Championship. Another Major for Padraig Harrington. And Denis Matyajaszek receiving the custard pie treatment from Daily Telegraph readers. Didn't think things could get any better? At 12.20 tonight (or rather in the early hours of Tuesday morning), BBC2 will show a classic episode of Ellery Queen: The 12th Floor Express. You can watch the first nine minutes of this wonderful mystery, set in the offices of a New York newspaper, here. For the rest of it, you'll just have to wait until the witching hour! Mystery fans are in for a real treat, and our dear friend 'slapheads anonymous' will have a great chance to compare the acting abilities of the late, great Jim Hutton (pictured above) with the much over-hyped Heath Ledger. Enjoy! It's always good to watch a neocon propagandist get the custard pie treatment from a newspaper's readers. In today's Daily Telegraph, there is a a foaming at the mouth Russophobic piece by the Henry Jacksonite Labour MP Denis Matyjaszek. (aka 'Denis McShane'-Matyjaszek is so proud of his Polish heritage that he prefers to use an Irish moniker). But the interesting thing is not so much Matyjaszek's entirely predictable article, but the reaction of Daily Telegraph readers to it. The neocons are trying their level best to turn British public opinion against Russia. But as you can see from the comments to Matyjaszek's piece, they are failing dismally. For Georgia, read Czechoslovakia. For South Ossetia read Sudentenland. For Russia read Germany. For Vladimir Putin, read Adolf Hitler. For 1938 read 2008. I think I might add 'For Bruce Barniston, read Idiot'. An interior ministry spokesman told the BBC it was not a military defeat but a necessary step to protect civilians from a "humanitarian catastrophe". Yeh, right. Georgia really cares about 'protecting civilians',- that's why they launched a brutal, murderous attack on the civilians of South Ossetia on Friday. But the removal of Georgia's troops from South Ossetia is not only a defeat for Georgia- it's also a humiliating defeat for the country's neo-con backers. It's not only that in having to deal with the Russian response, Georgia has had to withdraw 1,000 of its troops from Iraq. In his brilliant article for Prison Planet, Paul Joseph Watson, outlines the level of neocon involvement in Georgia's aggression (The Exile has more on the US involvement). The plan was simple- while the rest of the world attention was focused on the Olympics opening ceremony, a massive assault would be made to reclaim the province of South Ossetia. But it's a neocon-instigated plan that has spectacularly backfired. Russia is, quite correctly, ignoring US pleas for a ceasefire and, having liberated South Ossetia and saved its people from ethnic cleansing, is now focusing its attentions on reducing Georgia's military capabilities, to make sure that the country never again launches a war of aggression against the people of South Ossetia, or indeed against anyone else. Russia, and South Ossetia must make sure that peace comes on THEIR terms, and not the neo-cons and their puppets- who are at the moment in no position to dictate terms to anyone. And that not only means obtaining a written agreement that Georgia relinquishes all claims to South Ossetia and Abkhazia-but also that Georgia also pledges to drop its plans to join NATO, and becomes a neutral, non-aligned state, in the same way that the State Treaty- negotiated between East and West- ensured Austria's neutrality after World War Two. The US would simply not allow Mexico or Canada to join a Russian-led military alliance, with missiles pointed at New York, so why should Russia accept US military bases on its doorstep? UPDATE: James Jeffrey, US National Security advisor has made a valiant attempt to redefine the word 'chutzpah'. condemned Russia for its "dangerous and disproportionate" action against Georgia and warned of long-term damage to relations between Washington and Moscow. So there you have it. The country which just five years ago launched a brutal and unprovoked military assault on the sovereign state of Iraq, an assault which has led to the death of over 1m people- has the chutzpah to criticise other countries for taking 'dangerous and disproportionate' action. I don't know the Russian for that splendid old English expression 'go and eat coke', but it's the response to Jeffrey I would make if I were Russia's Foreign Minister. The US and Britain have called for an 'immediate ceasefire’ between Russian and Georgian forces, after just one day's fighting in South Ossetia. Could this be the same US and Britain that defied international calls for a ceasefire between Israel and Lebanon in 2006, even several weeks into the conflict? The US and Britain also say that they support Georgia’s ‘territorial integrity'. Could this be the same US and Britain who, by championing Kosovan separatism, showed nothing but contempt for the ‘territorial integrity’ of Serbia? There's no Olympic competition for 'Double Standards'. But if there were, then the US and Britain would be warm favourites to win medals. Well, it looked like it would be a competitive race, but by his actions over the past 24 hours the former employee of New York law firm Patterson, Belknap, Webb and Tyler, (who also happens to be the President of Georgia), has won this week's award by a landslide. Saakashvilli- that really should be Saakaswally-(pictured above with his good pal George W. Bush), thought he could use the smokescreen of the opening of the Olympic Games to launch a brutal military assault against the people of the breakaway province of South Ossetia. In a referendum, 99% of South Ossetians said 'nyet' to any association with Georgia, but hey, what does a little thing like democracy matter when you're the neocons' man in the Caucasus. But Saakaswally's cunning- (and utterly despicable) plan, has spectacularly back-fired. The murder of ten Russian peacekeepers - and the slaughter of hundreds of innocent South Ossetians has led Moscow to send in the tanks. And the planes. And now the hapless Georgian President is appealing for 'help' against Russian 'aggression'(!- yes, please try and keep a straight face) from the EU and the US. Right on cue, the professional Russophobes are crawling out from beneath their stones, penning their rabidly anti-Moscow propaganda pieces- a mendacious narrative in which the aggressors become the victims of aggression and the victims of aggression the aggressors. But this is one dispute that even the neocons can't spin to their advantage. Saakaswally took an almighty gamble- and lost. No one is going to go to his assistance. The former employee of Patterson, Belkan, Webb and Tyler is going to be taught a lesson he'll never forget. UPDATE: Mark Almond has penned a wonderful piece on the background to the South Ossetia conflict in today's Guardian. It's a great riposte to the mendacious neocon claptrap that's currently doing the rounds. The Exile will be blogging on the South Ossetia conflict all weekend and he's got some great posts up already. And you can read Svetlana's thoughts on Georgia's own version of 'Operation Storm', here. Well, how did you find today's opening ceremony? I certainly can't remember a more impressive one. I've always believed that the Olympics should be held permanently in Greece, to avoid the politicking, but after today's incredible show, I think it might be an idea for the Games to be held permanently in China, with the rest of the world chipping in to help with the expenses. It'll certainly be better than holding them in London. Can you imagine what the opening ceremony in 2012 will be like? The deadline for submitting your Top 10 is midnight Friday August 8th. Please type Top 10 in the subject line. Once all the entries are in a lucky dip draw will take place and the winner will be sent £100 worth of political books. The über-blogger elite, who think they own the blogosphere (I’m not naming names), and who seek always to set the parameters of ’acceptable’ debate, certainly won’t want to see this blog feature in the top 100. So please vote for it! UPDATE: I've been informed that the dealine for voting has been bought forward to midnight on Friday 8th August ie tomorrow night! So if you are going to vote, please try and do so asap! Many thanks. Well, for the first time ever we have a three-way dead heat. Three excellent letters on the glaring hypocrisy we've seen over the Karadzic affair, published in The Observer and Guardian. 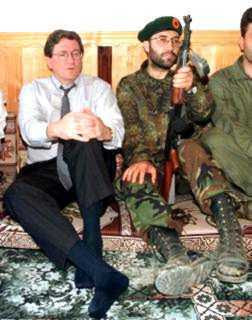 Liz Milanovich, Cathal Rabbitte and Peter McKenna (writing on our dear friend Richard Holbrooke, pictured above with members of that charming group of terrorists-oops sorry, 'freedom fighters', the KLA), come on down! Though Ed Vulliamy is on a rampage with the Karadzic arrest story ('I am waiting. No one has ever said sorry', Focus, last week), The Observer has overlooked that notorious Croatian Nazi war criminal Dinko Sakic (who died on 21 July) was buried in full Nazi regalia and that his funeral was conducted by a Croatian Roman Catholic priest. Interestingly, 'no one [on the Croatian side] has ever said sorry'. No outrage at The Observer. What does Slavenka Drakulic (Comment, August 2) mean when she talks about "our belief that [Karadzic] is different, that he is a monster and nothing like us." He looks no different to any western political leader. Is the massive difference in income levels between OECD countries and the rest of the world a natural phenomenon? Does it ever require the application of state violence? Shouldn't Karadzic say he was just doing as the others do? He could even have been a Des Browne or a Donald Rumsfeld, overseeing mass murder and ethnic cleansing in Iraq. Karadzic is no different to them, except that he lost. Had he won, perhaps he could have become a special Middle East peace envoy? "It's an invented story and no one ought to believe it," Richard Holbrooke says of the alleged secret deal with Karadzic (No chance of a fair trial, Karadzic says in first statement, August 2). In his June 1980 testimony before a House subcommittee, Holbrooke said much the same thing about refugees' accounts of death and devastation in East Timor, and the liquidation of a significant proportion of its population. He hailed Indonesia as "one of the greatest nations in the world". As the State Department's man in Pacific Asia, Holbrooke channelled covert aid to the Indonesian army in 1975 as it embarked upon invasion and genocide in East Timor.Should we really listen to him when he talks about war criminals? Happy 40th Birthday to Dad's Army! I hope British readers are enjoying the BBC’s excellent Dad’s Army weekend- to commemorate the 40th anniversary of Jimmy Perry and David Croft’s wonderful sit-com. You can watch an extract from the excellent ‘Don’t Panic!’ tribute programme the BBC showed last night, above, and you can read my own appreciation pieces on why Dad’s Army is still so popular here and here. 1. How many of today’s nasty, sneering sitcoms and so-called 'comedy' shows will be celebrated forty years from now? I’m sure it will be a big fat zero. 2. Why on earth haven’t Jimmy Perry and David Croft been knighted? We give knighthoods away so cheaply nowadays, including to pretentious writers of turgid, unreadable books read by probably no more than half a dozen people (yes Mr Rushdie, I’m talking about you); yet we don’t properly honour the two men who have, over the past forty years, bought so much happiness and laughter to millions of people. Don’t forget Perry and Croft didn’t just give create and write Dad’s Army, but It Ain’t Half Hot Mum and Hi De Hi too. I'm not a fan of the honours system, but if we are to hand out knighthoods- let's make sure they go to people who really deserve them. Former US negotiator Richard Holbrooke told CNN that Radovan Karadzic's allegations that he had cut a deal with the US were false. 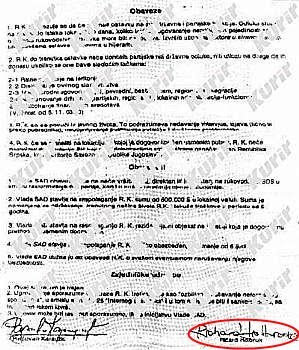 Well, above is a copy, in Serbian, of a written agreement between Holbrooke and Karadzic, courtesy of the Serbian newspaper Kurir, and Svetlana's Byzantine Sacred Art blog. And below you can read an English translation of the terms. Then you can make your own minds up as to the veracity of Mr Holbrooke's statement. 1. RK is under obligation to submit his resignation to all the state and [political] party functions. Decision comes to force within 90 days, as needed to settle the necessary issues with the rest of leadership. Resignation has to be irretrievable. Influence the leading party officials in a direction of easing the resignation issue and the change in the hierarchy. 3. RK will withdraw from the public life. This includes refusing to give interviews, statements (in person or through the intermediaries), non-publishing [illegible] of political and current problems. 1. United States Government is under obligation not to influence, directly or indirectly, the SDS leadership [Dr. Karadzic's political party] to affect dissolution of the party. 2. United States Government is making available the sum of 600,000 USD to RK, in the local currency. The sum is designated to enable RK's support in the 6 year period. 3. United States Government is making residential object available to RK, at the location agreed upon during the earlier verbal agreement. 4. United States Government is providing physical protection for RK, not less than 6 men. 5. United States Government has a duty to inform RK about every possible threat to his safety. 1. This agreement is permanent. 2. RK's violations of the agreement will be treated as a serious violation of the informal agreement, in the sense of the article 3 paragraph 25 of the Internal Regulations and in that sense it will be sanctioned with the immediate termination. With just seven days to go before the start of the 29th Olympic Games, here's my Observer article on my all-time Olympic hero, the great Belgian runner Ivo Van Damme. Who are your Olympic heroes? If one day this magazine were to publish a list of the 10 most heroic runner-ups in sporting history, Crisp's gallant weight-carrying performance in the 1973 Grand National, Greasepaint's two defeats in the same race a decade later and Queens Park Rangers' heartbreaking failure to win the 1976 Division One title would figure prominently. But top of the pile, I hope, would be the remarkable performance of a 22-year-old Belgian athlete at the 1976 summer Olympics in Montreal. Ivo van Damme arrived in Canada with a sporting chance in 800 and 1500 metres. He failed by a narrow margin to return home with two golds, but made a huge impact on a certain 10-year-old watching on television, thousands of miles away in the Midlands. It wasn't just the narrow nature of his defeats; there was something about van Damme himself that was so different from the other competitors. For a start, he had a beard. For athletes – and indeed all sports stars – long hair was almost compulsory in the mid-1970s. Beards, however, most certainly were not. There was, too, the question of his nationality: being Belgian is not always a plus point but to a devotee of Tintin and Hercule Poirot it most definitely was. In that long hot summer of 1976, the bearded Belgian became my hero. I had no doubt, that four years hence, at the Moscow Games (to which my uncle ambitiously planned to take all his nephews and nieces in his Bedford van), van Damme would emulate Kornelia Ender, the East German swimmer who had turned her Munich silvers into Montreal golds. It was not to be. Just five months after the Olympics, van Damme was killed in a head-on collision, on the autoroute between Marseille and Lyon, on his way home from a training session in the south of France. His death, at the age of 22, ensured he would always be the great lost talent of modern athletics. Ivo van Damme was born in Brussels on 21 February 1954, the son of a policeman. He turned to athletics late, aged 17. His first sport was football, which he hoped to play as a professional. A fractured arm and a family move to the small town of Veltem, in Flemish Brabant, changed all that. Van Damme joined his first running club, Daring club of Leuven, and athletics became his passion. At first he specialised in the 1,500m and 3,000m. His breakthrough came when he dropped back to 800m. The first time he ran the distance he clocked 2:07.20; a few months later he bettered that by five seconds. In his first major international competition, the 1973European Junior Championships in Duisburg, he finished fourth behind Steve Ovett. In 1974, his progress was checked through injury, but in 1975 he finished second in the European Indoor Championships in Berne, breaking Roger Moens's national record. With characteristic courtesy, van Damme waited for his compatriot to celebrate the 20th anniversary of his achievement, before replacing his name in the record books. After winning the same competition in February 1976, van Damme was set for the 21st Olympiad. Favourite for the 800m was the American Richard Wohlhuter. He was a silver medallist at Munich and runner of the fastest time that year. The Cuban Alberto Juantorena, the red-hot favourite for the 400m, which he duly won, was considered something of an unknown quantity at the longer distance, despite having recorded the second-fastest time of 1976. In the final, Juantorena led for most of the way, winning in 1:43.50, a new world record, with van Damme staying on strongly in second, in 1:43.86, the third-fastest time ever. It was a tremendous performance against an opponent in the form of his life. More than a second and a half behind van Damme, in fifth, was a young Steve Ovett, destined to win 800m gold in Moscow. In the 1,500m final, a week later, van Damme was up against the 'Flying Kiwi', John Walker, who a year earlier had become the first man to run a mile in under 3:50.00. With the first 400m run in a funereal 62.48 seconds and the 800m in 2:03.15, van Damme, the 800m specialist, must have felt his confidence growing. He was perfectly positioned when he became boxed in by the Australian Graham Crouch. By the time he had manoeuvred himself free, Walker had made his dash. Van Damme flew, but the effort cost him in the stretch and the New Zealander held on by a metre. Van Damme returned home a national hero, but he was not satisfied. He promised he would bring back two golds from Moscow. It was an Olympics he was fated never to see. How great could Ivo van Damme have been? The African nations' boycott deprived the 1976 800m final of the talented Kenyan Mike Boit. The 1,500m was similarly devalued by the absence of world-record holder Filbert Bayi of Tanzania and Walker's winning time was the slowest since 1956. Even so, had van Damme continued to improve – and there's no reason why he shouldn't have – one can assume that he would have been hitting the 1:42 mark for 800m by the 1978 outdoor European Championships, a time that would have won him the title. By 1980 (when he would still have been only 26 – Juantorena's age in Montreal), van Damme could have been established as the undisputed middle-distance champion of the world. The Coe-Ovett led renaissance of British athletics may well have had a very different ending. Van Damme is commemorated in the name of the annual international meeting in Brussels, which has become the scene of several record-breaking performances. This is a fitting tribute to a man who appeared to have time on his side but who ran out of that most precious commodity far too soon.